"The fifth volume in this much admired series offers another fascinating anthology. 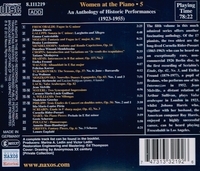 Of the 17 pianists, the two oldest are the long-lived Cornelia Rider-Possart (1865–1963) who can be heard on an exceptionally rare, non-commercial 1926 Berlin disc, in the first recording of Scriabin’s Etude, Op 42, No 3, and Etelka Freund (1879–1977), a pupil of Brahms, who performs one of his Intermezzos in 1952. Jean Melville, a distant relation of Arthur Sullivan, plays 'Valse arabesque' in London in 1923, whilst Johana Harris who, together with her husband, the American composer Roy Harris, enjoyed a highly successful career, can be heard playing Frescobaldi in Los Angeles."